Hello Schmop-tops! The new year is here and it brought Old Man Winter to Toronto, but the stage was on fire for the premiere of the Canadian Opera Company’s remount of their production of Richard Strauss’ Elektra. Directed by James Robinson and starring soprano Christine Goerke in the title role, this production sees the fall of the house of Agamemnon after his murder at the hands of his wife Klytämnestra and her lover Aegisth. After word reaches Elektra and her sister Chrysothemis of their estranged brother Orest’s death, Elektra vows to avenge her father in her brother’s stead. Orest arrives incognito and fulfils his sonly duty and the joy of knowing her tortures will end overcomes Elektra at the moment her father’s house is reunited. Christine Goerke (left) in a scene from the Canadian Opera Company's production of Elektra, 2019. Photo: Michael Cooper. What can one possibly say about Christine Goerke in this role and still do justice to the kind of singing we experienced on Saturday night? Her vocal range is not of this dimension and her finesse to Strauss’ bombastic score is something to be witnessed in person. The production was directed in a rather expressionistic style with large, presentational gestures and somewhat heightened physicality. Using her full body seamlessly as both an aural and visual instrument, Goerke’s Elektra brought very much the psychological struggle she was undergoing to the fore. 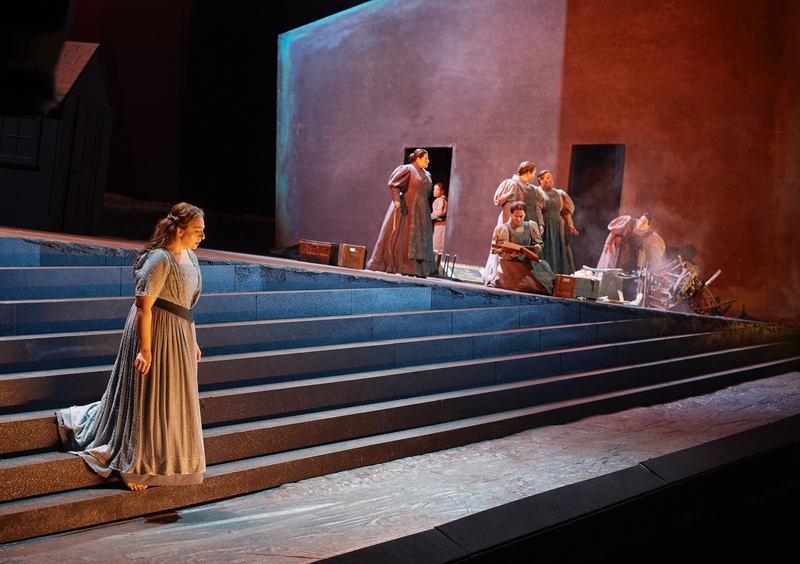 Erin Wall as Chrysothemis (foreground) and Christine Goerke as Elektra in the Canadian Opera Company's production of Elektra, 2019. Photo: Michael Cooper. 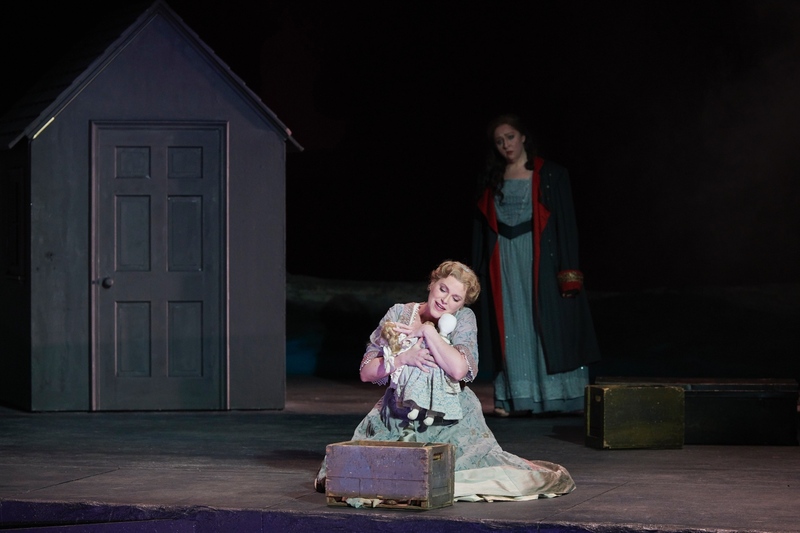 Singing the role of Elektra’s sister Chrysothemis, Soprano Erin Wall’s more delicate timbre was perfect embodiment of Chrysothemis’s longing for a simpler life of a wife and mother. The peace in Wall’s timbre was also a perfect match for Goerke’s more bombastic, revenge-driven tone. When they sang together the effect was thrilling. 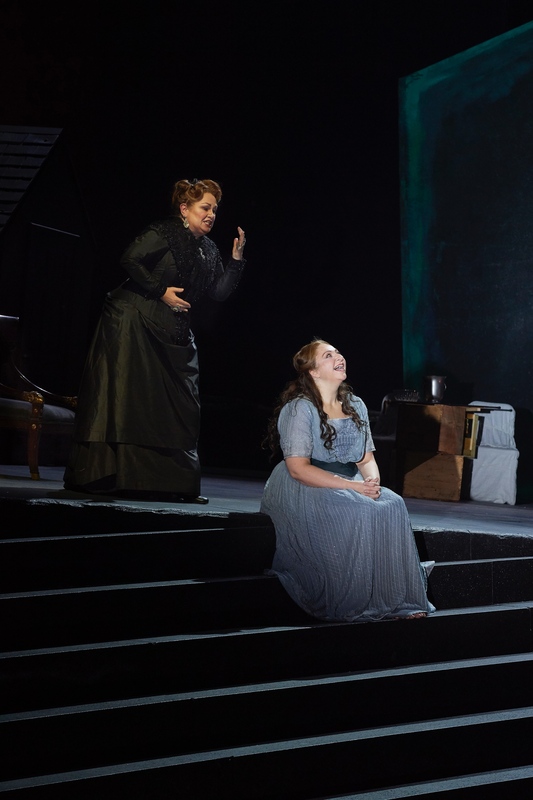 (l-r) Susan Bullock as Klytämnestra and Christine Goerke as Elektra in the Canadian Opera Company's production of Elektra, 2019. Photo: Michael Cooper. After singing the title role in 2007, Susan Bullock returns in the role of the murderous queen Klytämnestra. Her powerful voice coupled with her incredible characterization actually stirred sympathy for the anguish she suffers caused by her guilt. You could see the weight of the consequences of killing Agamemnon lying heavily on her shoulders as she tells of dreams that haunt her. Her fear was palpable when she begs Elektra how and who to sacrifice to rid herself of this torture. 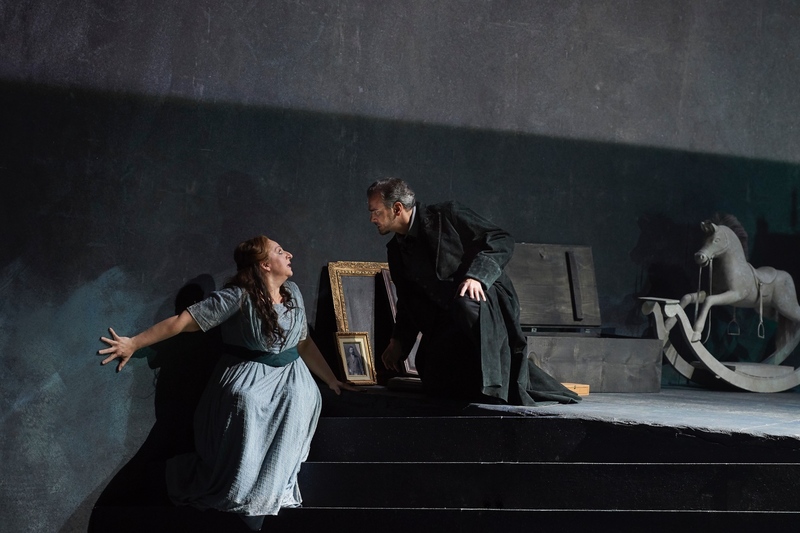 Christine Goerke as Elektra and Wilhelm Schwinghammer as Orest in the Canadian Opera Company's production of Elektra, 2019. Photo: Michael Cooper. Singing the role of Orest, Elektra’s exiled younger brother, bass Wilhelm Schwinghammer strode onstage and filled the hall with his robust, dark tone. The recognition scene with Goerke was mesmerizing. Tenor Michael Schade was every bit the grotesque that Elektra had spent the show describing. In his short appearance he manages to conjure enough animosity that you’re relieved to see him enter the house to his doom. A rather large supporting all sang beautifully as well as dramatically. The placement of the COC Chorus at the end of the show was chilling. You felt as though the whole city was chanting “Orest” outside the theatre. 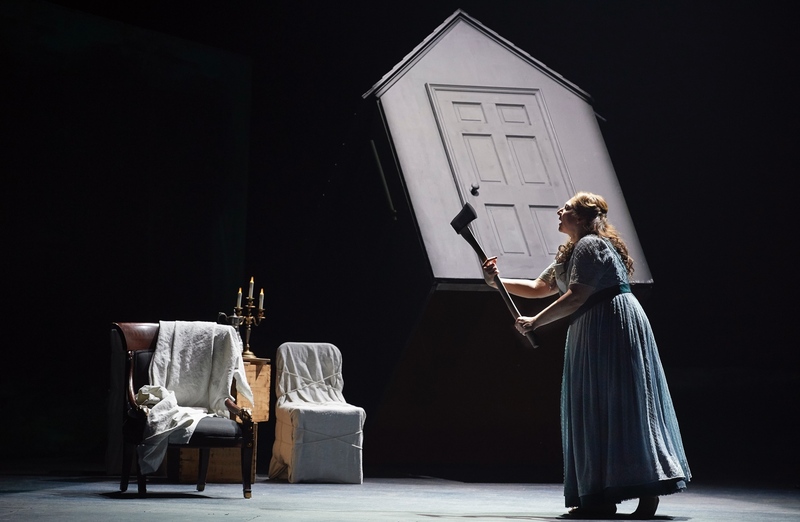 Christine Goerke as Elektra in the Canadian Opera Company's production of Elektra, 2019. Photo: Michael Cooper. The COC Orchestra under Johannes Debus played a nuanced score full of subtleties - not something usually attributed to Strauss. In the hands of great players and singers, that notion is put soundly to rest. Elektra runs until February 22, and I highly suggest you don’t miss this. This is Strauss at his best, sung by phenomenal singers, played with an incredible orchestra, and all coming together in a production to remember. Elektra runs through February 22 at the Four Seasons Centre. For details and tickets, click here.